The DXF interface in RFEM exports now a 3DFACE element in the DXF file for each FE mesh cell of the exported structure. 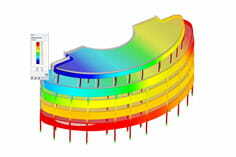 The 3DFACE element is detected by AutoCAD during import, for example, and can be displayed as a surface in the graphic. Different visual styles help display the 3DFACE surfaces in a desired view. You can find this 3DFACE option in RFEM under the DXF interface related to the file under ‘File’ → ‘Export’ → ‘ASCII Format Model (* .dxf)’ and in the direct interface under ‘File’ → ‘Export’ → ‘Autodesk AutoCAD’.